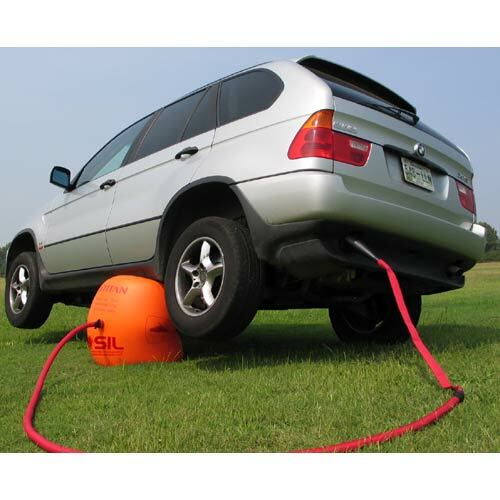 Air Jack quickly lifts your vehicle with its own exhaust gas. Lift your vehicle in 30 seconds without straining with an awkward, unstable jack. Simply fit the Air Jack’s hose over your exhaust, position the airbag under the vehicle, and turn on your engine. The exhaust inflates the bag, lifting the vehicle to 17″. A one-way valve keeps the bag inflated after the engine has been turned off. The durable Air Jack was originally designed for rugged off-road use and works in mud, snow, and uneven ground where a regular jack cannot. Has no negative effects on the engine. Comes in a handy carry case to fit easily in your trunk. That still does not look safe.